What a yummy recipe! I have done this several times now, to the delight of the family for whom I cook. The first time I made this, I followed the recipe exactly (but doubled for a big family). It was good, but seemed to be missing something. Since then, I have always added some Italian Seasoning, Paprika, and bread crumbs to the dry mixture. This makes the right mixture for me, and still produces extremely good chicken. I usually pour any remaining dry mixture on top of the chicken before putting it in to bake. I usually make this with thighs and legs. This is a regular in my monthly menu for "Fried Chicken Friday" where I generally serve a different fried/oven baked chicken recipe each Friday. Also, I have never had a problem with mushy coating. 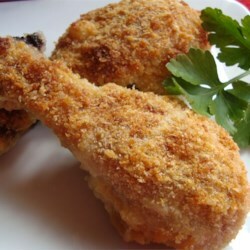 There will always be a little mushiness because of the juices from the chicken cooking out, but it is usually minimal, and typical of oven baked and coated chicken. I would say it is best to always use foil instead of a greased pan. You don't have to spray the foil either, that will help reduce the moisture in the pan and keep the potato flakes from reconstituting.